There is another grey mini just like mine in my office parking lot. Like magnets we always seem to park near each other. Today I found "the other mini" snuggled up right behind mine. You can imagine how many times I have stood next to the "the wrong mini" repeatedly pressing the unlock button with frustration until I realize it's not mine. 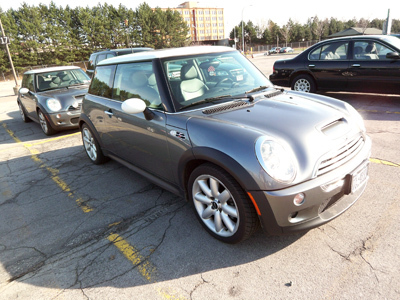 I have even tried to distinguish my mini from "the other mini". 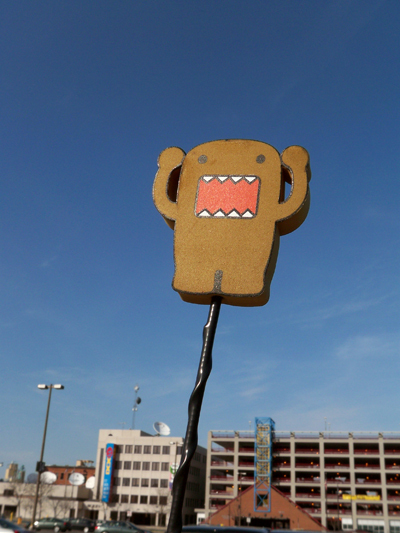 I added a Domo antennae ball. And a Cram Cream mushroom air freshner. I still try to get in "the wrong mini" on a regular basis. Oh the perils of being cool. There is another grey Matrix that parks on our street and about half the time we park next to each other. (Un)fortunately mine has radical decals from the previous owner, so it's easy to tell them apart. LOL I recently got a new car, I still try to find the old one all the time. Grey mini's probably like to huddle together for warmth,they are only small. 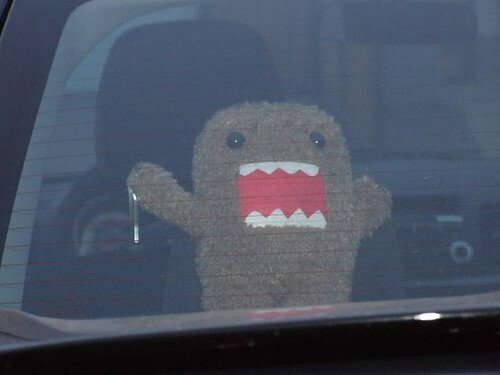 Domo lives in my car. My car has keyless entry, and I've gone up to a car, put my hand on the handle and wondered why it didn't beep. Domo always tells me when I'm right. Love your car! Your post made me chuckle...years ago I had a minivan, when they first became popular. I parked outside my friends house, and came out around dusk. I had tons of stuff in my hands and was fumbling around..got in went to turn the key, looked up and saw stuff all over my dashboard, and immediately thought, what the hell? Why is all this stuff in my van?....well, i was in the wrong van...her neighbor had left their door open and i got in the wrong one....i looked around a bit before climbing out..i was SO EMBARASSED. This was before the "cell phone" era, so when i got home I called my friend to tell her to let her neighbor know i wasnt trying to steal her van. I don't know where else to put this but have you heard of/seen the cricut?! I just saw the infomercial last nite and I thought of you. Totally off the subject... but when is the new banner coming? Its close enough to spring... we love your banners. 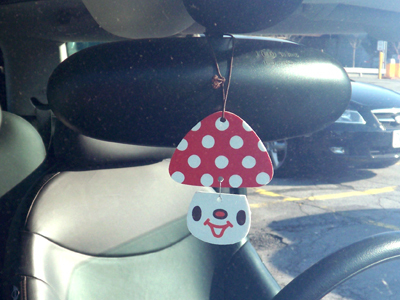 Your Cram Cream mushroom air freshner is soo cute! I'm curious... What scent goes it give off? domestic girl - it was strawberry, but it's all worn off now, but I don't have the heart to toss it.